Socks for Mark; socks for me. I typically only work on socks while commuting, with the exception of the tricky bits (turning the heel, setting up the gusset, or starting the toe), which I do at home. So, I’ve had this pair of socks for Mark on my needles since November. I’m finally on the second sock and working on the leg of this toe-up pattern. But, since my total knitting time per day on this sock is only about 40 minutes max, it’s still going slowly. I can’t wait until they’re done, so I can start on another pair of socks for me! Pillow covers. I really need some throw pillows in my living room. I bought pillow forms about a year ago and have some yarn in my stash that would make great pillow covers (a washable, wool-hemp blend, a superwash wool, and a washable cotton blend). I want them badly, but I’m not sure if I want them badly enough to bump them up higher on the project list. Baby sweater. A guy I work with will be welcoming in his second child in just a few weeks. If I’m going to gift him with a sweater, I gotta get a move on. Hat. Lillian (my MIL) saw my warm earflap hat and suggested that if I was thinking of doing a hat anytime soon, she’d love something that covered her ears. Winter will be over in just a couple months, so practically speaking, this needs to start soon, too. Lampshade. Yeah, this sounds like a weird project, but it’s one I’m trying out now. We have these table lamps we picked up at Ikea in the living room, and the cat went postal on one. The shade was just paper and it was totally wasted. However, it looked like it would be an easy knit to replace it. A simple tube, knit in the round in a combination of garter stitch and purse stitch. I started it last weekend before I had sorted out all the rest of these projects. Now I feel compelled to finish it. After all, the naked lamp is ugly at this point, and I hate letting things sit on the needles. Sweater finishing. As I just said, I really hate to leave things unfinished, and I’ve had this one sweater sitting around awaiting final finishing for many months now. Now that I have a new “owner” lined up, I need to pick it back up and finish it. Sweater starting. I so want to knit myself another sweater. There are several tempting patterns, and I’ve got plenty of nice yarn to play with. This is at the bottom of the list ’cause I’m sure it’s not going to happen any time soon. But I can dream, right? I have finished the sweater! 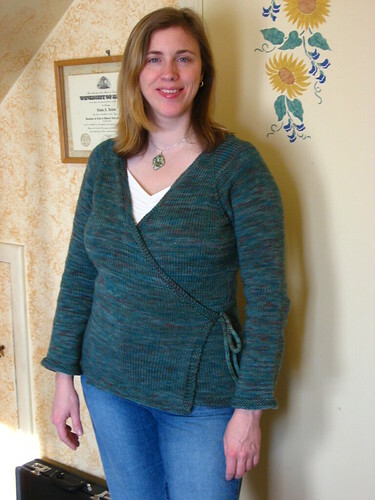 Neckdown Wrap Cardigan (#263) from Knitting Pure & Simple. Yarn used: Dream in Color Classy in color Good Luck Jade. It seems like I’ve been working on this thing FOREVER. And I still need to block it (I think) in order to make the neck edging lay down completely flat. Where do I start with explaining the challenges I had with this seemingly simple pattern? I wanted to add waist shaping, but apparenly made this decision a bit late in the pattern. So, I ended up ripping back several inches in order to start at the right place (just after the underarm). Then I had to rip it back again when I realized I miscalculated when to start the increases again. At this point, the “frog count” was 2. After I finished the bottom garter stitch edging and cast off very loosely (using a loose cast off often used for lace: K1, slip stitch back to left needle, K2tog, repeat endlessly), I realized that the cast off was TOO lose. The bottom was sort of wavy. Hmmm…I’d fix that later. Next, I picked up stitches for the first arm. Once I had finished all the decrease rounds, I tried it on. Hmmm…the arm seems kind of tight. I ripped it back. The frog count is now 3. My stitch gauge was spot on, so I decided to alter the decrease rounds a bit. 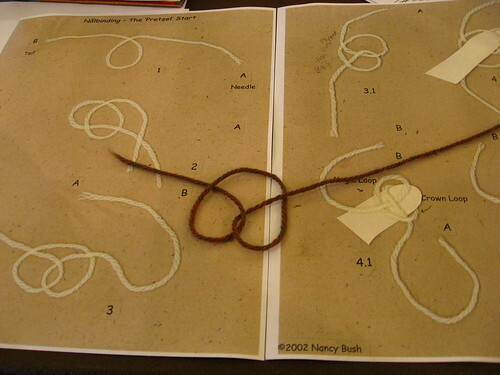 Instead of knitting one round plain between the decrease round while do the initial decreases, I knit 2 rounds plain. I also decreased every 6th row, instead of every 5th row as called for in the pattern. The arm still seemed sort of tight at the top, but I was done with ripping on this sweater, so I just hoped it would feel a bit looser after wearing and/or blocking. If I made this again, I’d adjust the decreases again to be further apart, and I wouldn’t decrease as many stitches, either. I don’t have large upper arms, so this issue with the sleeve width stumps me. Anyone else have the same problem with this pattern? I would have knit the sleeves about 1/2 inch longer if did this pattern again. Even though I tried it on, because the sleeves were so tight at the top of the arm it was hard to determine the best length very accurately. After the sleeves, I made the i-cord ties. The pattern calls for very long i-cord ties. I made them the length called for, then I tried the sweaer on. They were way too long for my comfort, so I ripped them back several inches. Now the frog count is 4. Finally, I undid the bind off on the bottom, tinked back the garter stitch border, and re-knit it on the smaller needles (US 7). I bound off in my usual fashion: Lucy Neatby’s ingenious bind-off, which makes a decently stretchy bind-off for everything but toe-up socks. Is that bad for a hand-knit, custom fit sweater? The fit is close and it accentuates my curves quite well, I think. However, I wish there was a bit more coverage on the back of the neck. Some short rows would have really helped there. My final problem with this pattern was the yarn calculations. Even though the pattern said I only needed 1120 yards of yarn, I used a bit over 1250 yards on the sweater. I ordered a last minute skein from The Loopy Ewe so I could knit the i-cord in the same weight of yarn. IF I had used my yarn extremely frugally (e.g. carefully left only the bare minimum length of tails needed to weave in ends) I may have been able to use only the original 1250 yards. I guess that color name — Good Luck Jade — didn’t work it’s magic for me, eh?